Global dimming term was introduced in 1990s which means the decline in global radiation. This decline was reported in several studies across the world. In the present study time series analysis of global radiation (1960-2003), transmissivity (1960-2003) and bright sunshine hours (1973-2003) has been done over Nagpur during pre-monsoon (March to May) and monsoon seasons (June-September). A significant decrease in global radiation and transmissivity has been reported for both the seasons and it was higher during pre-monsoon compared to monsoon. Bright sunshine hour has also shown good agreement with the previous trend with a significant trend on pre-monsoon months only. Mann Kendall test was performed to confirm the significance of reported trend. Amount of solar radiation reaching to the Earth’s surface determined by the atmospheric conditions, latitude and seasons. Solar radiation flux at the Earth’s surface is the primary source of energy for life as well as a regulator of climate on our planet . Solar radiation incident on the Earth’s surface is very important in many applications; such as atmospheric energy balance studies, global land carbon sink studies , canopy gas exchange processes , analysis of thermal load on buildings, and solar energy collecting systems. For designing any solar energy conversion device (Solar collectors, photovoltaic, solar thermal generator), amount of insolation availability at that site is needed. A complete knowledge of solar radiation is very important for understanding the climatology of any place. But with urbanization , industrialization and other anthropogenic activities, atmospheric load has been increased which has caused sufficient reduction in solar radiation (global dimming) and it is reported in several studies [5-7]. Aerosol effect the incoming solar radiation directly by scattering and absorption of solar radiation and indirectly by acting as cloud condensation nuclei [8,9] which decides the fate of cloud and it also alter the reflectivity of cloud for solar radiation. Multidecadal changes in incoming global radiation are highly modulated by cloudiness  at the surface. Natural forcing of Earth’s Climate has been observed on both global and regional scale with small variation in solar irradiance [11,12]. Net radiant energy available to the Earth’s atmosphere is a driving force for monsoonal rainfall , so any change in it will disturb the monsoon patterns and dynamics that will affect hydrosphere, atmosphere, lithosphere and biosphere. So the long term trend analysis of solar radiation is very essential to understand the different changes which are occurring or have already occurred in the perspective of climate change. Many studies have been done to see the long term trend of solar radiation on annual scale but not much emphasis has been given on the analysis of long term seasonal trend of solar radiation. To feel this gap we have decided to see the change in solar radiation on seasonal scale. Our main aim of this paper is to find whether such decreasing trend is also applicable for Indian conditions in different seasons or not? In the present study trend analysis of solar radiation for pre-monsoon and monsoon seasons were studied over Nagpur to see the possibility of declining trend for these two seasons. Significance of trends were analysed by using non parametric statistical test “Mann Kendall Test”. Secondary data for radiation for Nagpur is obtained from India Meteorological Department (Pune). Nagpur (21˚08′N, 79˚10′E) is a part of Maharastra, India whose elevation is 310 m from sea level. It has tropical wet and dry conditions prevailing for most of the year. Radiation data comprises global radiation, (1960-2003) and bright sunshine hour, (1973-2003) has been divided into two seasons pre-monsoon (March-May) and monsoon (June - September). The was measured using pyranometer. Sunshine recorder was used to calculate . All these data are quality checked and calibrated to world radiometric references . Transmissivity was calculated as a ratio of global radiation to extraterrestrial radiation. Here extraterrestrial radiation was computed using formula given by . Average of both the seasons was calculated to get trend. Mann Kendall Test [16,17] was conducted to test the significance of reported trend. Here we have calculated Mann Kendall Statistics , variance of and then statistics. A very high positive value of is an indicator of an increasing trend and vice versa. Then values of calculated are checked at = 0.01 level of significance. 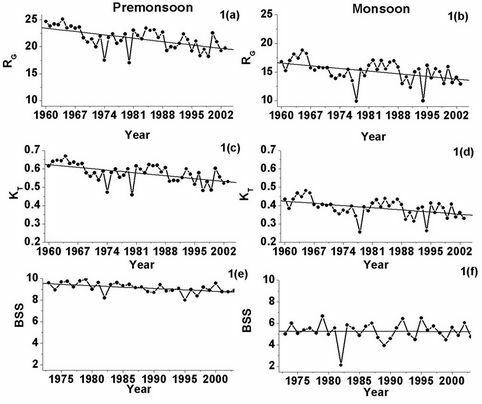 In Figures 1(a) and 1(b) trend of in pre-monsoon and monsoon seasons are shown where decline can be observed clearly. Values of in pre-monsoon are more than the monsoon because in monsoon cloud cover increases which obstruct the incoming solar radiation. Slopes of trend line are given in Table 1 and it was found to be negative for both the seasons –0.088 for premonsoon and –0.066 for the monsoon. Same behaviour was observed in case of (Figures 1(c) and (d)). Figure 1. Trend of global radiation (RG) in MJ·m–2, transmissivity (KT), and bright sunshine hour (BSS). Table 1. Mann Kendall Test Results (S score and trend for RG, KT and BSS for pre-monsoon (March-May) and Monsoon (June - September) seasons along with their slope. ranged between 0.45 - 0.67 in pre-monsoon and 0.25 - 0.48 for the monsoon. have also shown good agreement with previous trends (Figures 1(e) and (f)) for premonsoon seasons and also high values with negative slope (–0.025) (Table 1), whereas no significant trend was observed in case of monsoon irrespective of negative slope (–0.001). 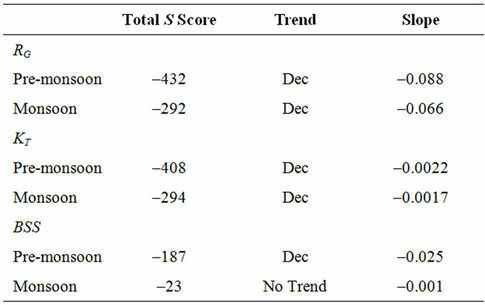 Mann Kendall test results are shown in Table 1, has shown statistical significant declining trend in both pre-monsoon and monsoon season, was also found to be statistical significant for premonsoon but no trend has been observed for the monsoon. score for monsoon season in on negative side (–23) but still it was found to be insignificant. have also declined significantly in pre-monsoon and monsoon. If we seen score then it was lowest in pre-monsoon for all , and intending towards the more decline, as a more negative value of indicates a more decreasing trend . where is the extraterrestrial radiation at the top of the atmosphere and , , , and are the five transmissivities representing Rayleigh scattering, permanent gas absorption, absorption by water vapour, absorptions and scattering by aerosols and cloud components, respectively. The change in is oftenly linked with 11 year solar cycle  but these variations are of smaller magnitude compared to variations observed in the solar radiation [19,20]. The increase in Rayleigh scattering and permanent gas absorption has also less affect in causing any variation in [6,19]. It has been confirmed that a 10% increase in atmospheric water vapour content would cause decrease in < 0.5% , so it is not very sufficient to cause significant effect on . So the rest two transmissivities and are the only two factors that can effect the incoming solar radiation. Measurement of both these factors is very difficult because of large variation in the aerosols and cloud optical properties and their distributions both in time and space . Aerosols and clouds are not very much independent but they interact in various ways through different processes . The source of aerosols in the atmosphere is anthropogenic as well as natural in nature. With increase in population and to satisfy the need of increasing population many industries are spreading day by day and these urbanizations, industrialization and other anthropogenic activities are contributing more in aerosol load in the atmosphere. Nagpur which is a big city represents a typical urban area with population of about 4.05 million . Aerosols from transport sector, industries and biomass burning are the main sources of anthropogenic aerosols. In premonsoon months concentration of aerosols from these sources increases very much in the absence of scavenging mechanism (wet deposition). This city also experiences a very hot summer that causes the excessive dryness in the soil and lead to the addition of more soil borne aerosols in the atmosphere. So the contribution of both natural and anthropogenic aerosols explain the decreasing trend of , and . But in monsoon months sky is obscured by cloud and these clouds reflects and backscatter solar radiation  and cause a significant reduction in solar radiation in monsoon season. The slopes of , and in premonsoon months is more negative than the monsoon months. In premonsoon months concentrations of aerosols are more as compared to monsoon month where precipitation decreases the aerosols concentrations. Aerosols also contribute its effect in altering the properties of cloud i.e. they increase the reflectivity of cloud which is the indirect effect of aerosols. Thus, in both the months (premonsoon and monsoon) aerosol play a very significant role in dimming of that also decrease the trend. The trend in is not significant in monsoon months as sunshine recorder which is used for the measuring the is not very much sensitive to catch the variation in solar radiation. Long term trend of , and are analysed in premonsoon and monsoon seasons over Nagpur. The values of , and has been reported more in the pre-monsoon than monsoon season. In monsoon months most of the times overcast situation exists that cause less penetrations of solar radiation. But in general decreasing trend, in and are more in premonsoon months compared to monsoon months. In premonsoon months concentration of aerosols is higher than monsoon months because of anthropogenic and natural sources. The concentrations of aerosols are minimal in monsoon months because of precipitation’s scavenging mechanism. This indicated that the influence of clouds is important in explaining the fewer values in monsoon months over Nagpur. However, the aerosols is playing significant role in explaining the decreasing the long term trend of . In premonsoon months where aerosol concentration was higher have shown more decline in trend. We have also observed negative trend in monsoon months and it was due to the combined effect of both aerosols and clouds. The have also shown good agreement with the trend. have shown decreasing trend in premonsoon month but in monsoon it was not significant but have shown negative value and slope. Thus, after the analysis of trend it is clearly visible that aerosols direct (scattering and absorption) and indirect effect (altering cloud properties) make it a potential candidate for becoming the main culprit of solar dimming in both the seasons. But still there is a need of detail investigation to understand the role of aerosols and clouds in dimming of solar radiation. We gratefully acknowledge India Meteorological Department, Pune for the required data sets to carry out present work. We would like to thank Space Applications Centre, Indian Space Research Organization (ISRO) for necessary funding, and support. We are also thankful to Prof. N. C. Mahanti, Head, Department of Applied Mathematics, Birla Institute of Technology, Mesra, Ranchi, for his support and encouragement for the work. G. Stanhill and S. Cohen, “Global Dimming: A Review of the Evidence for a Widespread and Significant Reduction in Global Radiation with Discussion of Its Probable Causes and Possible Agricultural Consequences,” Agricultural and Forest Meteorology, Vol. 107, No. 4, 2001, pp. 255-278. doi:10.1016/S0168-1923(00)00241-0. S. Solomen, et al., “The Physical Science Basis. Contribution of Working Group I to the Fourth Assesment Report of the Intergovernmental Panel on Climate Change,” Cambridge University Press, Cambridge, 2007. J. Srinivasan and P. C. Joshi, “What Have We Learnt about Indian Monsoon from Satellite Data?” Current Science, Vol. 93, No. 2, 2007, pp. 165-177. R. Burman and L. Pochop, “Evaporation, Evapotranspiration and Climatic Data,” Elsevier, Amsterdam, 1994, p. 278. R. O. Gilbert, “Statistical Methods for Environmental Pollution Monitoring,” John Willey and Sons, Inc., New York, 1987, p. 336. M. G. Kendall, “Rank Correlation Methods,” 4th Edition, Charles Griffin, London, 1975, p. 202. M. Wild, “The Heat Balance of the Earth in GCM Simulations of Present and Future Climate,” Zuechercher Geografische Schriften, Vol. 68, 1997, p. 188.